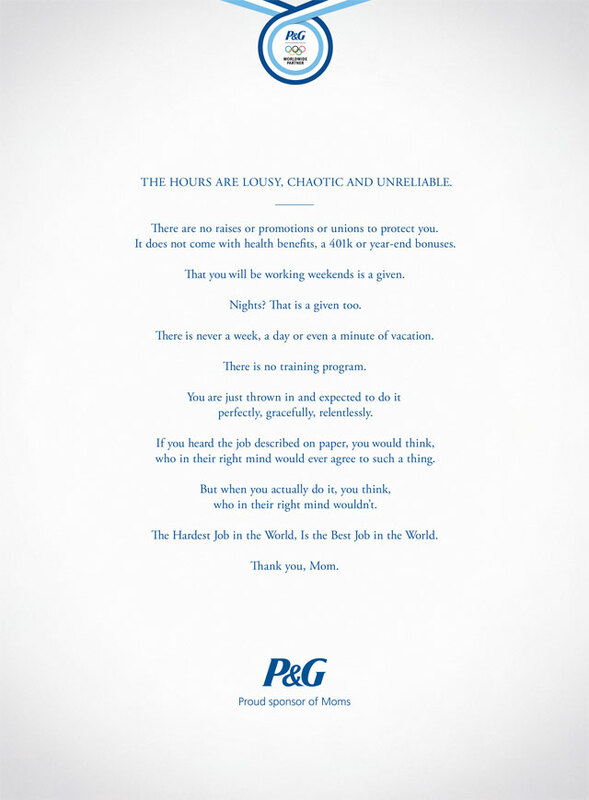 As "The Proud Sponsor of Moms," P&G took its North American "Thank you, Mom" campaign global for the London 2012 Games and kicked it off with the two-minute "Best Job" commercial directed by Alejandro González Iñárritu which was followed by Daniel Kleinman's "Kids 2012." An important piece of the campaign was the W+K Entertainment and Yahoo! web series “Raising an Olympian” – documentary-style videos that shared the journeys of several Olympians in becoming world-class athletes, as seen through the eyes of their moms. -"Best Job" wins the Emmy for Outstanding Commercial of 2012. -"Proud Sponsor of Moms" campaign wins a gold Titanium and Integrated Lion at Cannes – a confusing confluence of different metal types. -"Best Job" wins two golds and three silvers at Cannes. -"Best Job" wins gold at One Show. -The "Proud Sponsor of Moms" campaign wins gold Effie. -The launch of the 2012 campaign is covered in the New York Times. -"Best Job" gets a "Gold in the Branded Entertainment Category" from Forbes. -More coverage in Shoot, Campaign and Creativity.